Mark Sikorski stands next to his citrus green 1972 Chevrolet Nova. Sikorski will be one of many who plans to show his car Thursday during the 20th anniversary Hot Rod Magazine Power Tour at the Isle Casino Hotel in Bettendorf. More than 3,000 hot rods and high-performance vehicles will converge Thursday on the Isle Casino Hotel in Bettendorf as part of the 20th annual Hot Rod Magazine Power Tour. Area residents are welcome to bring and register their vehicles for the show as well. More than 3,000 hot rods and high-performance vehicles will converge Thursday on the Isle Casino Hotel as part of the 20th annual Hot Rod Magazine Power Tour. More than 3,000 hot rods and high-performance vehicles will converge Thursday on the Isle Casino Hotel in Bettendorf as part of the 20th annual Hot Rod magazine Power Tour. 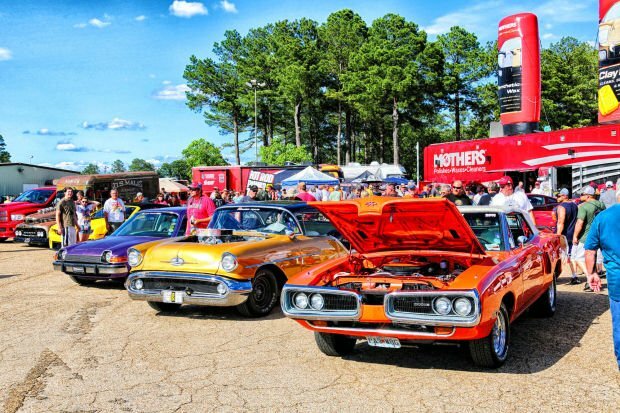 The event, free to spectators, features not only vehicles of every make and model, vintage, class and modification, but it also offers a carnival-like midway brimming with more than 50 performance manufacturers and after-market specialists. Among them is Chevrolet Performance, whose lineup at the show will include the 2014 Corvette Stingray and Camaro ZL1. Adding to the fun are entertainment, games, giveaways and motorsports celebrities signing autographs. Attendees will be able to do everything from testing their car's torque and horsepower on the Lucas Dino Challenge to educating themselves on car care at the Fram Filtration sprinter van and 24-foot trailer with video screens and interactive displays. The seven-day, seven-city Power Tour last stopped in the Quad-Cities during 2004 when 2,000 vehicles descended upon the Mississippi Valley Fairgrounds. Jeff Dahlin, the publisher of Hot Rod magazine, said the Quad-City area has a strong following of automotive enthusiasts and the magazine has long wanted to bring the tour back here. Another reason for the return, he said, was that the magazine wanted to include cities that had been on previous stops as a way of celebrating the tour's 20th anniversary. The Quad-Cities is the sixth stop on this year's 1,500-mile tour, which began Saturday in Charlotte, N.C., on and ends Friday at the Wisconsin Dells. The hours for the show are noon to 7 p.m. at the Isle Casino Hotel, 1777 Isle Parkway, Bettendorf. Cars on the tour are expected to arrive at the Isle's parking lots along the Mississippi River at 2 p.m., but area residents who want to display their vehicles can begin to register as early as noon. For more information, visit hotrod.com. Among the Quad-Citians planning to show their vehicles are Michael Dittmer and Mark Sikorski, both of Davenport. Dittmer will drive his viper blue 1989 Chevrolet Camaro. Sikorski plans to show his citrus green 1972 Chevrolet Nova. Both agree that the Power Tour brings motor enthusiasts together, provides them with full access to the performance car world and allows them get up close and personal with cars that actually are being driven instead of hauled in a vehicle transport. “You see the best of the best,” said Dittmer, 28, who attended the 2004 Power Tour in Davenport. His Camaro was a birthday gift from his father when he turned 16. Sikorski's Nova salutes the Chevrolets modified by American race car driver Don Yenko, who offered after-market high-performance packages for Chevrolets in the 1960s and early 1970s. Sikorski's Nova is not a true Yenko Chevrolet, but it sports the car's distinctive “sYc” (Yenko Super Car) graphics as a tribute to the legendary car builder. Yet, it has a four-speed manual transmission and a big-block 427-cubic-inch engine worthy of a serious driver. Sikorsky, 50, is happy to share his Nova with other car buffs at an event that he says has everything for them. “It is a rolling car show,” he said. But the term has a much broader application today, said Jeff Dahlin, the publisher of Hot Rod magazine. While hot rods certainly include customized cars such as 1932 Fords and other cars from the '40s and '50s, he said, today's breed also brings in modern muscle cars as well has high-performance trucks. In fact, he said, souped-up trucks are the fastest-growing aspect of the hobby. And while not every 16-year old can afford today's pricey high-performance cars, he said, there are a number of older models that are within reach. They include the 1979-93 third generation “Fox body” Ford Mustang. While the technically complex engines powering today's cars often are no match for shade-tree mechanics, Dahlin said, the advent of computers has made it possible for performance enthusiasts to make some modifications. For example, they can change shift points and make other adjustments using devices such as a cellphone. Interest in high performance is reflected in the growing circulation of Hot Rod, founded in 1948 and the largest car performance magazine in the world, Dahlin said. The magazine was revamped a year and a half ago by stepping up photography, using a higher grade of paper, adding more pages and sprinkling pages with fun facts, he said. Readership is predominantly male, he said, with older readers leaning toward the print edition and the younger audience gaining access via the website, social media and YouTube.